Guess what? Now that I am shredding all the plant debris from my fall clean up, I don’t think I will even fill my three compost bins. And, I am worried I will become one of “those people” who take their neighbors’ plant debris in an effort to get more material to compost. Why? Because I love compost. But I will fight that urge. The neighbors are probably already wondering what I am up to as I roll my chipper shredder out of the garage and back to the garden to spend a few happy hours shredding and chipping plant debris. This afternoon, I topped off a beautiful day of working outdoors with some chipping and shredding. I cleaned up some birch branches from my neighbor’s tree that fell over in the wind a few weeks ago. Oops, did I say I was not going to become one of those people who goes around the neighborhood to find more plant debris? I'm not, really, I just couldn’t resist those birch branches. See how nice they look in the picture, so ready to be chipped up? No, I did not chip up the main branches... too thick and really too pretty to chip up. They might be useful for a wood crafter to do something with. 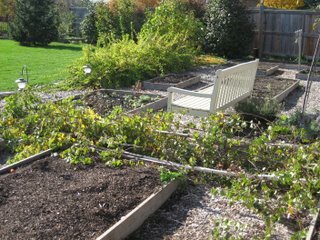 Anyway, when I was done with the birch branches, I cut down some perennials around the grape vines and sent those through the shredder. I’ve got a pretty good system going now. I lay out a tarp, set the chipper shredder on it, then shred up a pile of plant debris onto the tarp, then carry the tarp with the shredded material to the compost bin and dump it in. I have figured out what plant material to send through the top chute, and what sticks to send through the side chute. Now I can just take the tarp and chipper shredder around by all the flower beds, cut down the spent flowers, chip and shred it all right there on the spot, and then move on to the next area. I think my clean up will be done in no time at all. But, what if I don’t fill my compost bins? I am impressed that you have a chipper. I can't say that I really need one, but I think it would be a ton of fun to have. Is it bad to take other peoples' yard debris? I live on two brand new acres and I cruise slowly up and down the established neighborhoods on garbage day, stopping and throwing full bags of leaves into the back of my truck! I also ask friends to bring their leaf bags to church!! I don't have a single tree for leaves!! I do mow the whole front with the push mower and the bagger on, so I can get the clippings!! Be careful with the chipper.. If the neighbors have set their composting material out for refuse pickup, it's fair game. I wouldn't worry about not filling them all up. Just build your bins/piles one at a time. There will be plenty more material as time goes on. You still have spring cleanup to look forward to. Oooh--I'd love to have a chipper/shredder! All of my leaves would compost so much faster--and I have a huge silver maple that is forever dropping branches. I know how you feel about eyeing the neighbors' yard waste--I have plenty of leaves, but several of my neighbors bag their lawn clippings when they mow, and I have considered grabbing the bags. I would, too, if I could be sure that they were chemical-free. Every T-Th I cruise the neighborhood near my kid's school after I drop her off and I pick up 4-6 bags of leaves. Why, especially if I live on a 5-acre lot? Because urban gardens most likely don't have poison ivy! The only "bad" thing I have found in my pilfered bags is pinecones. But they get shredded, too. We used to pick up leaves, too, but as Colleen says, you don't know where those grass clippings have been! I loved the way our Illinois shredder made gigantic piles of pruned wood into wood chips. Please be careful with the shredder, Carol! A pair of Felco pruning shears once dropped out of my pocket, into the chute... the machine gave a little hiccup, spit out a mangled, melted looking blob of metal and roared on. If you like, you can pack up your chipper/shredder, come on over to the old homestead and go to town! We haven't done any clean-up yet. Do you hear it? It's calling your name - do you hear it? I didn't know compost was such an interesting subject. But of course I'm not the gardener in the family. After a few more years,Carol, you may have the rich soil we have, due to your father's efforts. It's good some people have green thumbs. Don't give up, don't be discouraged! Thanks all for the comments, and I will be careful, I promise!